Life’s a beach behind The Break’s front desk and fluorescent fish tank! 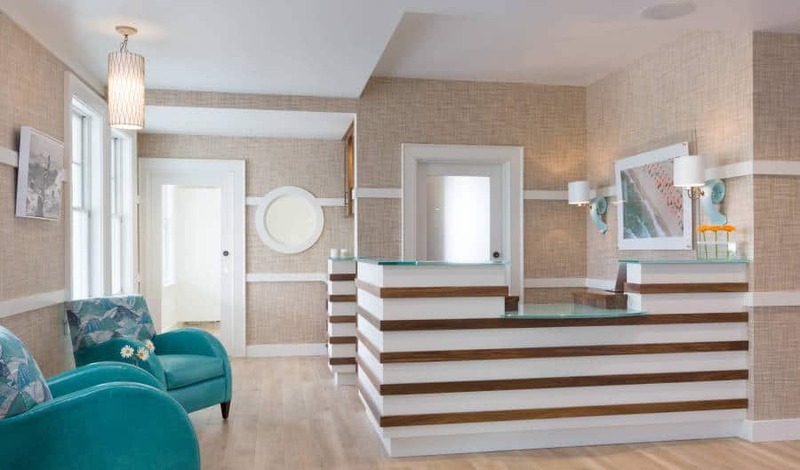 General Managers Heather and Michael share their thoughts on life at the helm of Narragansett’s surf-inspired coastal cool boutique hotel. Q: What drew you to hotel management? A: We both have hospitality backgrounds, love to cook, and genuinely enjoy hosting people in our home. Hotel management seemed like an opportunity to combine all of the above! We greatly enjoy creating the full experience for our guests, and it has been gratifying to be a part of their special moments. A: No commute (as we live on site) and the fantastic beach location! Seriously, though, our favorite aspect of this job is that it offers the opportunity to meet new people from all over, every day. It keeps things fresh and exciting while expanding our perspectives. Q: What’s the best compliment you have ever received about your hotel? A: We’ve been overwhelmed by the positive feedback and support from our guests, so it’s hard to narrow down! We often hear that our guests love the breakfast, the beds, the vibe, and the warmth of our staff, but ultimately when an individual can think of no single thing they would change about the time spent here, that is the highest compliment we can receive. Q: What do you like best about your location? A: The fabulous summer weather and stunning coastline. Narragansett has such a wealth of natural beauty to enjoy that it feels like an escape from the hustle and bustle of “normal” life. Having an ice cream shop right next door isn’t so bad either. Q: Most rewarding guest experience? A: We had a guest bring us flowers just to say thanks during our opening week, and I was so touched that I cried.